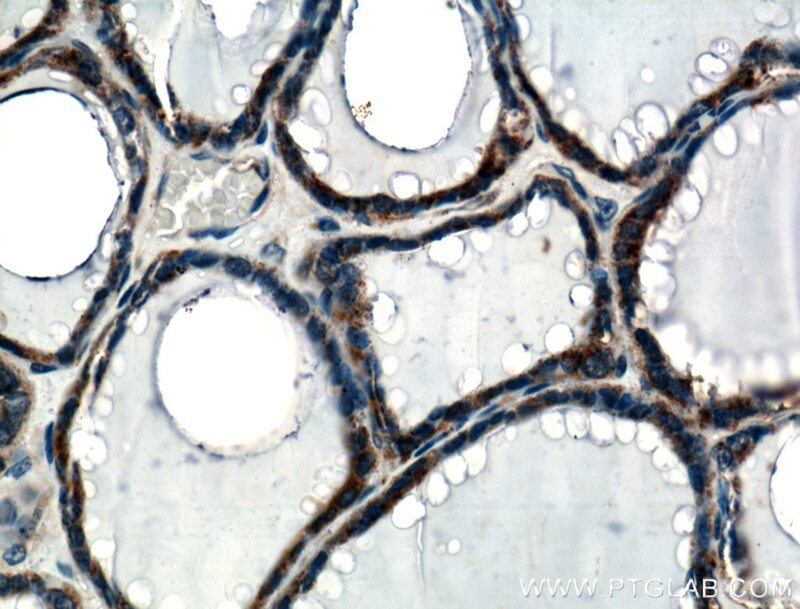 Immunohistochemical analysis of paraffin-embedded human thyroid tissue slide using 10292-1-AP( calreticulin Antibody) at dilution of 1:200 (under 10x lens). 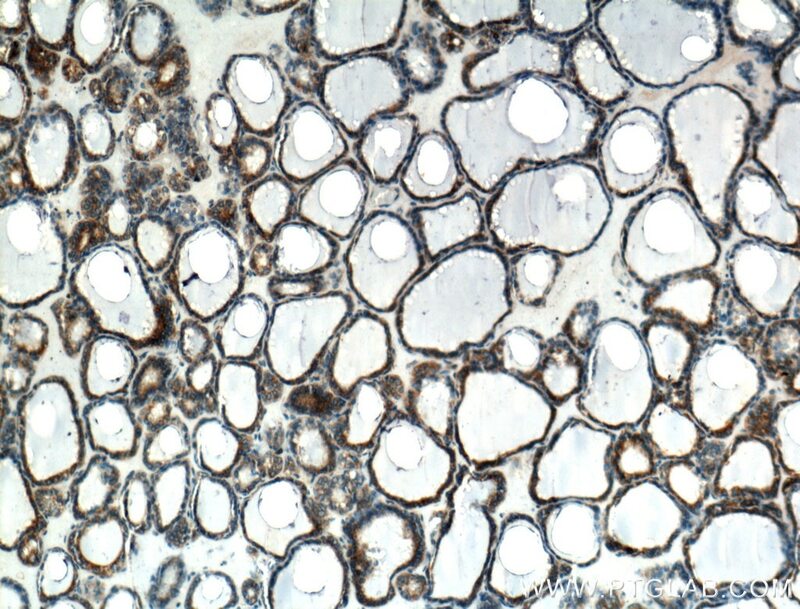 Immunohistochemical analysis of paraffin-embedded human thyroid tissue slide using 10292-1-AP( calreticulin Antibody) at dilution of 1:200 (under 40x lens). 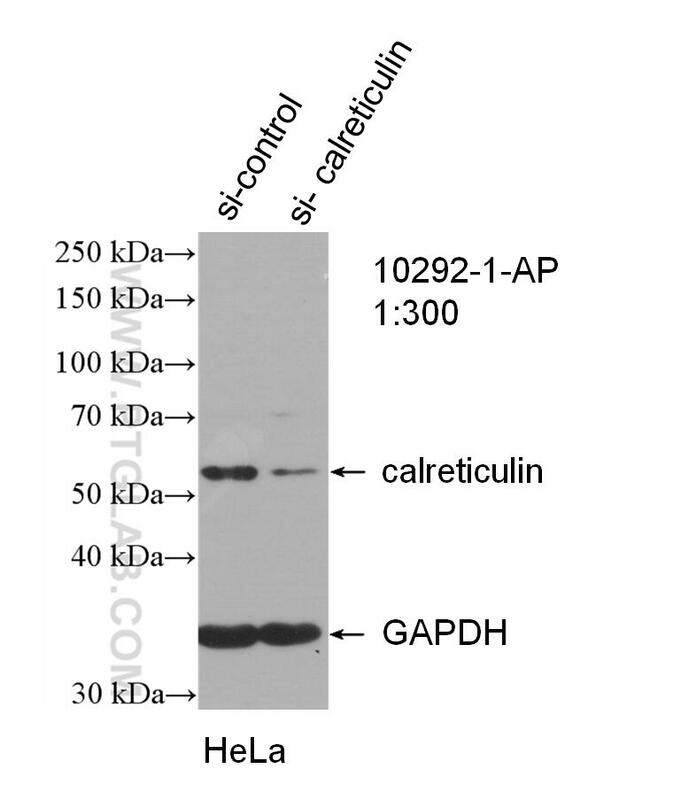 CALR,also named as grp60, ERp60, HACBP, CRP55, CRTC and Calregulin, belongs to the calreticulin family. It is a molecular calcium-binding chaperone promoting folding, oligomeric assembly and quality control in the ER via the calreticulin/calnexin cycle. CALR is a ER marker. It interacts transiently with almost all of the monoglucosylated glycoproteins that are synthesized in the ER. CALR interacts with the DNA-binding domain of NR3C1 and mediates its nuclear export. The MW of CALR migrates aberrantly at 55 kDa by SDS-PAGE. Some study provided that it's a new possibility for CRT-mediated tumor immune prevention and treatment. Calreticulin regulates TGF-β1-induced epithelial mesenchymal transition through modulating Smad signaling and calcium signaling. Beta cell extracellular vesicle miR-21-5p cargo is increased in response to inflammatory cytokines and serves as a biomarker of type 1 diabetes. 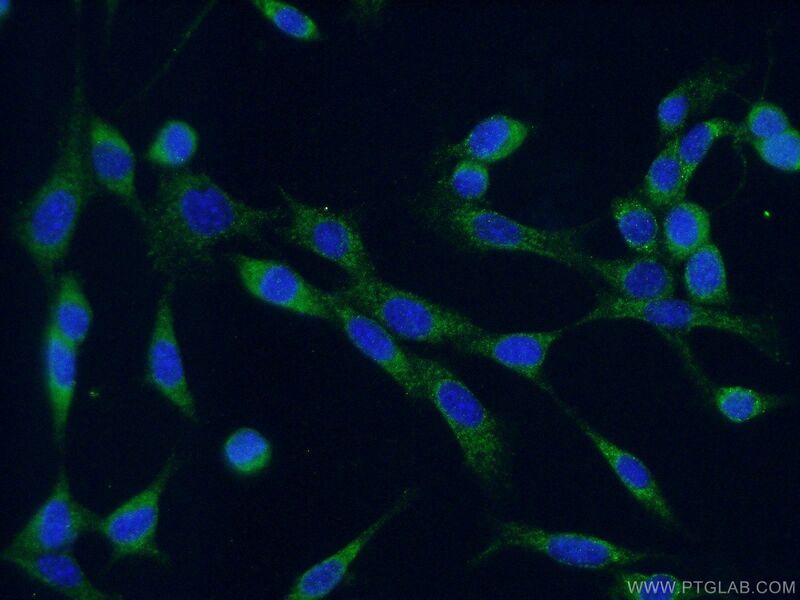 Exosomes derived from breast cancer lung metastasis subpopulations promote tumor self-seeding. Identification of PGAM1 as a putative therapeutic target for pancreatic ductal adenocarcinoma metastasis using quantitative proteomics. Autophagy defects and related genetic variations in renal cell carcinoma with eosinophilic cytoplasmic inclusions. DNA damage triggers tubular endoplasmic reticulum extension to promote apoptosis by facilitating ER-mitochondria signaling. 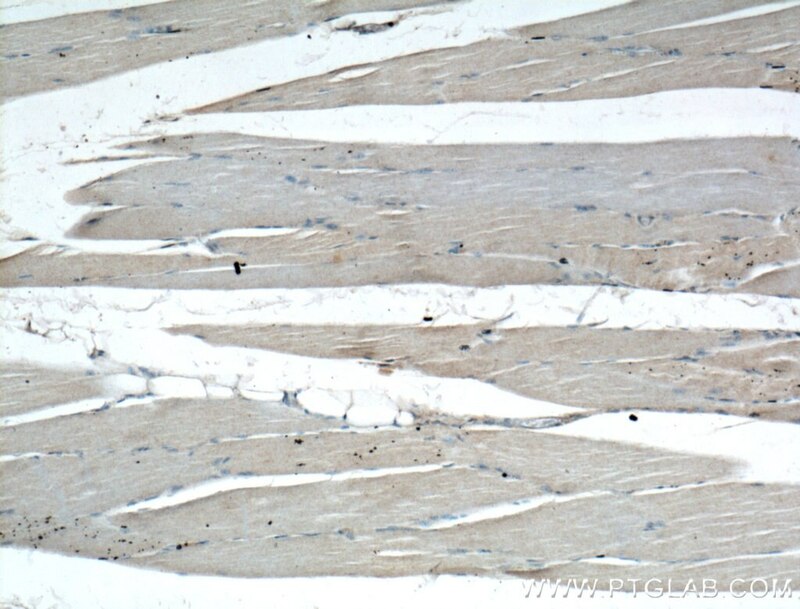 Immunohistochemical analysis of paraffin-embedded human skeletal muscle tissue slide using 10292-1-AP( calreticulin Antibody) at dilution of 1:200 (under 10x lens). 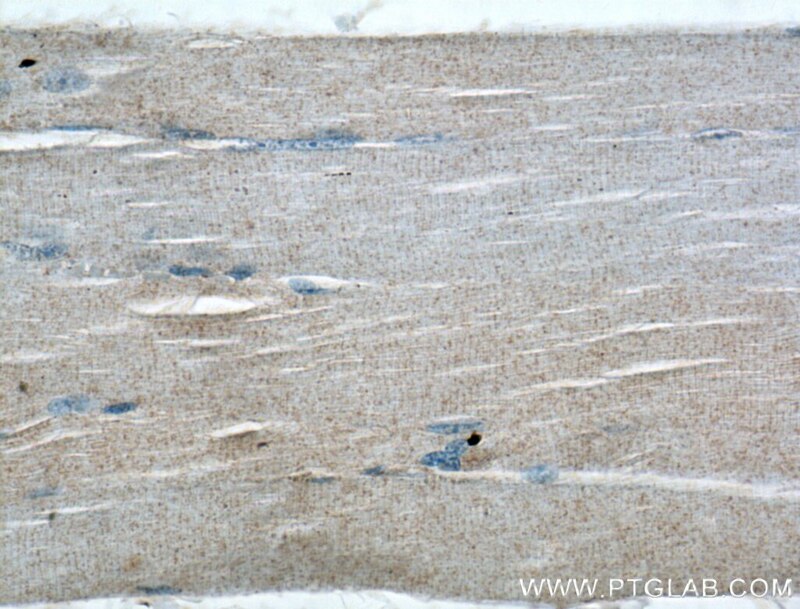 Immunohistochemical analysis of paraffin-embedded human skeletal muscle tissue slide using 10292-1-AP( calreticulin Antibody) at dilution of 1:200 (under 40x lens).